This old fashioned, made from scratch, homemade vanilla pudding recipe is serious comfort food. It’s easy to make for use as a pudding or vanilla pudding pie filling. Yep. I this is one I’ve moved over from Texas Well Seasoned. My dad used to say that eating anything vanilla was like kissing your sister – boring. Well, I happen to really like vanilla, and when it’s done right it has all of the passion and temptation of chocolate. 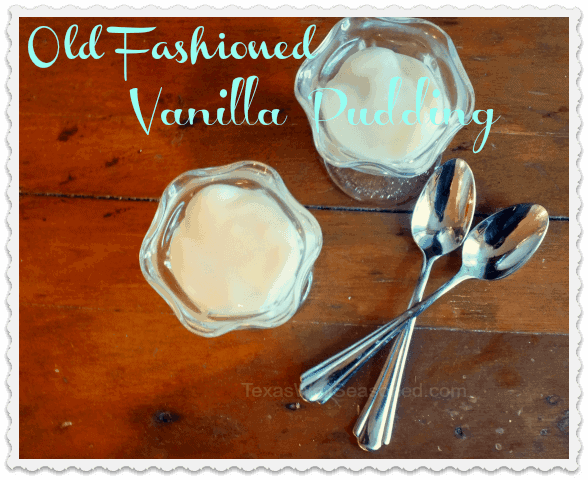 Like this homemade vanilla pudding – it’s not bland for sure! Don’t you love the smell? I do. My family has learned to indulge my preoccupation with keeping the house from smelling like dogs. Really. We have four of them – yes FOUR – and two cats – and a chicken. I am not even one of those people who thinks that the animals are my small, furry children. I like dogs but I like them to know that they are dogs, you know? So why do I have so many? Let me explain, ‘k? Dog number one is about ten years old. He was found in the street outside my house with half of his head caved in. I made him comfortable in a box in the laundry room, petted him, gave him a little water with a dropper and prayed for his soul… you know… because I really figured he was going to die. He didn’t. He is half blind, half deaf, and all brain damaged but we love him. He is a little long haired black and white mutt with maybe some chihuahua in there. Dogs number two and three moved in when my husband did. I take no responsibility for them – but I am getting used to them. They are slowly making the transition from “furbaby” to “dog”. I figure it was a fair trade, I brought eight kids to the marriage and he brought two dogs and two older kids. I think it pretty much balances out. The dogs are vicious Yorkies, and they are a tiny bit stuck up because of their pedigrees. They remind me of the cats in Lady and the Tramp but they are growing on me. I no longer consider trading them to the local Chinese restaurant for a years worth of free egg rolls. Dog number four came into our home last October. We found a starving, shredded pit bull mix. You do not want to know the details but suffice it to say that his chest and side looked like hamburger. We cleaned him up, spent way to much money at the vet, and Ethan claimed him as his own and named him Cuddles. Yes, yes we do have a 65 pound pit bull named Cuddles but this does not come as a surprise to many people who know us – we have a chocolate tortoise shell cat named Snowball. That’s a whole ‘nother story. Anyway, the female Yorkie weighs all of 4 lbs soaking wet and she spends her days swinging on his ear – hanging on to his ear for dear life while he tries patiently to dislodge her. So, we have these dogs (and cats) and sometimes, even though I live in a really huge, old house with really high ceilings, it gets to smelling a little doggy around her. Thus? Candles – the original thing I was talking about. Welcome to my ADD world. So I light candles, the really smelly expensive ones, all over the house. I like food flavors so there are things like buttercream, hot cocoa, and of course vanilla and vanilla variations. One of my favorites is vanilla chai. Mmmmm! The smell is a combination of comfort and yum that makes my mouth water and my mind wander… more than usual I mean. This vanilla pudding goes together fast and easy with no worries about scorching because you are going to make it in a microwave. The vanilla flavor is intense because we are going to use TWO kinds of vanilla in it. When you use two kinds they sort of fight for dominance and each becomes stronger in the process. This recipe makes about 5 servings of homemade vanilla pudding or will fill one 8-inch pie. rich, creamy vanilla pudding is an old fashioned treat updated to be fast and easy in the microwave. Intense vanilla flavor. Mix the sugar, salt, and cornstarch in a microwaveable bowl. Add the milk and cream, whisking constantly. Microwave on high for about 8 minutes (or until thick), stirring ever minute. Remove from microwave, whisk in butter and vanillas. You can use brown sugar instead of white for a caramel or butterscotch flavor.